Amongst all the cool stuff at PINK14, there was one brief event the significance of which may have passed most people by. The future of ITSM whispered to me. 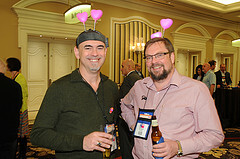 I was at the "PINK14" Pink Elephant ITSM Conference (again) this year in Las Vegas. It is an awesome event. But amongst all the mind-blowing stuff that went on, there was one brief moment that I thought was ...well... momentous, yet I suspect most attendees barely noticed. I'm not refering to Commander Chris Hadfield singing "Space Oddity" live to us. Nor the Rolling Stones almost playing live at the conference party (it is hard to top last year's Pink Floyd cover band). Nor the excellent Pink Think Tank where a small brains trust (small brains-trust not small-brains trust) analysed the complexity of multi-supplier value streams for you - more of this later. All the tools in the Exhibit Hall didn't move me (they never do: tech just doesn't float my boat). I spoke to lots of amazing people and got some great ideas, but none of them were it. I didn't get to any of the fourteen (14) concurrent streams of sessions so they may well have been momentous but it passed me by. It wasn't eating in the Bellagio's Prime restaurant, though I will long remember that (and Picasso and Sensei restaurants in past years). 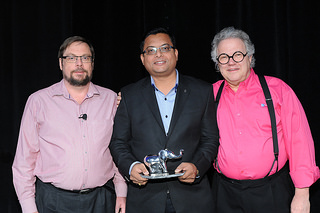 What happened that gave me a shiver of premonition was that Mr Siddharth Shetty won the Pink Elephant ITIL Practitioner of the Year Award. Good on him, you say. Who? you say. Siddharth is an operations manager in the Asia-Pac region for Amdocs, a global service provider. He's based in Pune, in India. He went and got the certifications to do this, then drove the programmes including all the associated cultural and organisational change, whilst still running his day job. What was so momentous about this event? To the best of my knowledge this may be the first Pink Elephant award to go outside North America except for one to CERN and another to a top-scoring student in Hong Kong. And Siddharth worked HARD. What an awesome throughput. It was a hard performance to beat. Here comes India. And China next. That's our ITSM future, right there. or at least a little whisper of it. Listening?